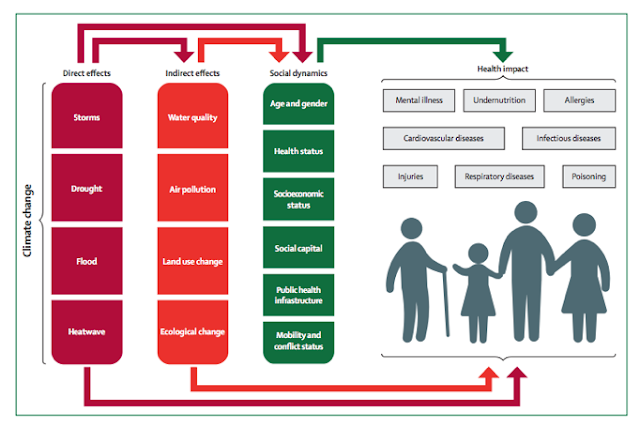 According to the Health and Climate Change Commission of The Lancet, the greatest opportunity in 21st century health is an adequate response to climate change. I have to confess that, had I been asked, I would surely have answered that the next revolution in health would be technological, probably connected to personalized medicine, 3D printing or electronic health. We think that way because we take for granted that achievements in health are permanent and that climate change is not a health problem. However, the truth is that anthropogenic climate change threatens the advances made in public health in the last fifty years. The World Health Organization already attributes a quarter of the burden of disease and death in today's world to environmental factors and, if it continues, can have a serious impact on health in any region of the planet in the next fifty years. Human activity is transforming ecosystems quickly and deeply, and generates an increasing impact on all dimensions of people's health and well-being. This can be direct, as is the case of extreme weather events, or indirect, through the alteration of the ecosystem by contamination of water, air and food, or social changes. Consider, for example, the increased risk of infectious diseases transmitted by mosquitoes, in allergies or migrations forced by desertification and its consequences. The Lancet Countdown is collaboration between twenty-four academic and intergovernmental institutions that monitors and provides an independent evaluation, using forty indicators of the effects of intervening or not doing so to reduce the risks that climate change has on health. The Lancet highlights the leadership role that health professionals must adopt to raise awareness that acting to alleviate and mitigate the threat of climate change is the greatest public health opportunity of the 21st century. Despite this positioning and commitment, paradoxically the health sector ignores its own contribution to environmental problems. Hospitals, health organizations, the pharmaceutical and biomedical industry, either directly or indirectly through the products or energy they consume or the waste they generate, have a significant impact on the health of the planet and its inhabitants. The environmental impact of an activity, organization or product on the planet is known as its "carbon footprint". This is quantified by calculating the totality of greenhouse gases emitted as a direct or indirect result of its activity (or its life cycle, if we refer to a product), and expressed in tons of CO2. The National Health Service has estimated its carbon footprint in more than eighteen tons of CO2 per year, accounting for 25% of emissions from the British public sector. This impact is not so strange if we think that the health sector consumes 8-10% of GDP in Europe and up to 18% in the United States. Health care facilities are some of the biggest fossil fuel consumers in the entire economy. Health Care without Harm is an international alliance formed in the nineties whose mission is to renovate the health sector so that it’s ecologically sustainable and it does so with a global vision. Its president, Gary Cohen, explains in an interview that if the set of American hospitals were a country, it would emit more greenhouse gases than all of France. Apart from the evident consumption of energy and fossil fuels, the biggest source of contamination in hospitals is the supply chain, which accounts for 60% of its carbon footprint. These are, for example, medicines, health care materials, food, transport, toxic waste, packaging, etc. If you have eight minutes and want to know more, listen to Cohen’s clarifications in this video on how hospitals contribute to the environmental threat to health and what they can do to reduce it and act more responsibly with the community. You will notice that yet again, Kaiser Permanente is involved and is ahead of the rest. Leadership. Commitment to the prioritization of environmental health. Chemical products. Replacement of toxic products with more safe ones to protect patients, professionals and the environment. Waste. Elimination of toxic incineration of sanitary waste and promotion of "zero waste" policies. Energy. Implementation of clean and efficient renewable energy generation systems. Water. Reduction of water consumption. Recycling and water treatment to minimize contamination and ensure access to water free of contaminants for the community. Transportation. Promotion of local public transport for patients, family members and staff, to reduce pollution and respiratory diseases in the community. Food. Purchase and consumption of healthy foods obtained by sustainable means. Medications. Safe management of medicines and reduction of the environmental impact of their waste. Related to the Safer Pharma campaign of GGHH-Europe, which promotes the protection of the environment from pharmaceutical contamination in all stages of the life cycle of medicines, including their rational use. Building and facilities. Responsible design and construction that minimizes damage to the community and the environment. Shopping. Buying safer and more sustainable products and materials. As the promoters of Health without Harm explain in the video Do No Harm, climate change is a health emergency. The Hippocratic Oath must evolve and pass from the primum non nocere referred to the patient to a more global vision of health, since it’s not possible to have a healthy population if you live on a sick planet. In this context, the Right Care movement also acquires a new meaning and adds value. Because, beyond the immediacy of stopping activities to avoid the waste of resources and the eventual iatrogenic on people, it’s an exercise of responsibility with the community and avoids unnecessary damage also on the planet and consequently, on the health and well-being of its inhabitants. Etiquetas: Evironment, Right Care, Roure C.
The content of this week's article has been developed, over the past few years, with my colleague and friend Miquel Àngel Mas (@DrMqAgMas), a geriatrician, former PhD student in our research group and currently a member of the expert nucleus in chronicity of the Gerència Territorial Metropolitana Nord de l'Institut Català de la Salut. We’ll discuss the subject from two points of view in the hope of generating interest and debate among the blog followers. Our health and social system experiences periods of rethinking, mainly due to the changing requirements in the need of attention of older adults. This fact suggests that the approach to problems solving from the big acute hospitals, as structures that works separately from the community, loses centrality. The logic that follows is the evolution towards increasingly integrated systems, adapted to the different territories, with primary care and attention to the community in the middle. As Professor Dennis L. Kodner said in his classic - Integrated care: meaning, logic, applications, and implications - without a discussion at different levels, all aspects of the provision of attention suffer: patients lose (and get lost), the services are not provided correctly (or arrive late), the quality and the satisfaction of the patients goes down and the potential for sustainability of the system diminishes. Etiquetas: Frailty, Geriatrics, Hospitalization at home, Inzitari M.
In a previous post, "Against manual medicine," I analyzed the concern of two internal physicians at Brigham and Women's Hospital for the excesses of manual medicine in their book When doctors don’t listen. Avoid misdiagnoses and unnecessary tests. 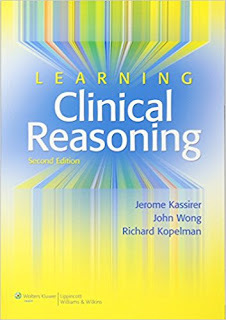 on this same subject I want to talk about Jerome Kassirer, John Wong and Richard Kopelman, three authors who in 1991 published Learning Clinical Reasoning, a reference work that laid the foundations of clinical reasoning through the inferential process of hypothesis generation diagnosis, its subsequent refinement with the elaboration of a diagnosis of work, the sustained request of complementary tests, the management of Bayes' theorem, the causal models, the diagnostic verification and the taking of therapeutic decisions. Twenty years later, the same authors published the second edition of the book, and in their presentation said they were forced to update it because in recent times, the practice of medicine had undergone very profound changes. 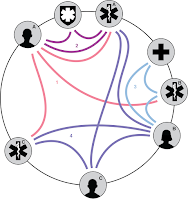 According to them, rapid triage in emergencies and reduction of hospital stays are forcing doctors to be less contemplative and they are often seen short-circuiting the diagnostic process, or by cutting out minutes of time spent in interviewing or exploring where they try to compensate by quickly sending patients to perform diagnostic tests. This obsession with the performance of physicians is detrimental to the reflection on what has been learned in the observations made and the establishment of a qualified relationship with the patient. The authors state that the diagnostic process, as it was known, has been replaced by "take a look and ask for a CT". In the 2018 edition of the Mobile World Congress has drawn to a close. Among the different technologies exhibited this week at the mobile fair, the chain of blocks or blockchain has appeared tangentially. Announced as the new revolution in the digital world - which some consider as disruptive as the internet - the block chain is the technology that allows the popular bitcoin crypto currency to work and whose value has reached unimaginable value (exceeded $ 18,000 last December). But what is really the block chain and how can it be of interest to the readers of Advances in Clinical Management? Blockchain is a distributed database system that allows transactions between agents to be both secure and anonymous by means of a trusted timestamp in the distributed public registry (distributed ledger). Although its best known application is to carry out operations with cryptocurrencies such as bitcoin or ethereum, the chain of blocks can also be used to manage valuable elements such as certificates, insurance or votes, and is being widely experienced in different sectors such as finance, logistics or food. The 2017 Nobel Prize in Economics was awarded to Richard H. Thaler ,from the University of Chicago, for his contributions to behavioural economics. As I have explained before, this discipline combines the teachings of economics and psychology to better understand and predict human behaviour and to help us make better decisions, especially in areas such as health, where the combination of having to take many decisions involving risk and having to share private information with people with whom our incentives are not always perfectly aligned, makes us sensitive to multitude of emotions, failures of rationality and psychological biases. Etiquetas: Behavior, Economy, Rey P.
Do all professionals working in primary care develop their professional skills adequately? My answer is no, and I believe that the paediatric service of primary care is one of the services in which there is more room to rethink the model of care. To make it easier, I will explain the model of childhood health (this is how I like to express it) that we have been developing for some years at the Can Bou Health Center (CASAP). A model that is gradually becoming known and extended to other primary care centres and which has been presented to national and European congresses and has received great interest on the part of managers and experts in paediatrics and who, at the moment, is offering specific training for those who want to a change orientation of the care of children and their families in primary care. 24/7 virtual visits: also in medicine? A few days before Christmas, I went to London. It was freezing cold and the heavy snow made it difficult to access the big city. In Piccadilly Circus, the street musicians resisted the low temperatures and the Christmas lights adorned the city. 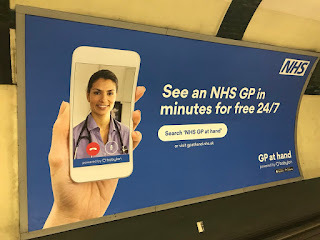 When I took the subway, I was surprised by an advertisement: "An NHS family doctor visits you for free 24 hours a day, 7 days a week." The Babylon Company has reached an agreement with the NHS to offer video consultation services. Citizens can download the application and request a visit with an NHS doctor 24 hours a day, with a response time of about two hours. According to the program website, face-to-face visits can also be scheduled if necessary and prescriptions are sent to the pharmacy of the user's choice. The family doctors attending the video consultations are from the NHS and have about ten years of experience. Etiquetas: Telehealth, Telemedicine, Torrente E.
Integrated Practice Units: what for? ABIM ACP ACSC Active management of patients Adequacy Admissions Alignment Almiñana M. Alzheimer Antibiotics Appleby J. Apps AQuAS ASP Bacteriemias Bayes Bayona X. Beds Beer C. Behavior Benchmarking Berry L. Berwick D. Bias Big data Big Med Bioethics Blockchain Blood Blood pressure Blue Botton Blue ocean Bohmer R. BP Breast cancer Brownlee S. Brugués A. Buurtzorg Caesarean Cardiology Care Management Casado S. CASAP Cassel C. Castells A. CCM CDVC Central de Resultados Chalmers I. Choosing wisely Christensen C. Chronic CHW Cifu A. Cleveland clinic Clinical management Clinical practice guidelines Clinical safety CMS Cochrane Colon cancer Colorectal cancer Commissioning Commonwealth Fund Communication Community Computerized clinical history Computerized medical history Continuing Care Conversely law Coordination Copayment COPD Cost Cost–effectiveness COT Coulter A. CPR CSC CTPA Dabigatrán Dartmouth Atlas De la Puente ML. deBronkart D. Deprescribing Depression Diabetes Diagnostic imaging Disease mongering Do not do Doctors leadership Domiciliary Donoso Ll. Dyer O. E E-mail EBM Economy Eddy D. Edusepsis Effectiveness Efficiency EHR Electronic Health Record Elwyn G. Emergency Empowerment Escarrabill J. Essencial Evaluation Evidence Evironment Extensive model Factory Fast-track Femur fracture Figueres J. Fisher E. Font D. Fontalba A. Fontecha B. Forest P. Fragmentation Frailty Frances A. Funding Galvez G. Gálvez G. Gamification Garcia Armesto S. Gavilán E. Gawande A. GEDAPS Genome Geriatrics Gigerenzer G. Giuliani R. Glasziou P. Godlee F. Goetz T. Goodwin N. Gøtzsche P Governance GPC Gray Zone Guest J. Guyatt G. Halvorson G. Ham C. Hankins M. Harris I. HCII Health determinants Health Education Health literacy Health policies Health Portal HealthConnect Healthwise Heart attack Heart Failure Heart surgery Heath I. Heuristic effect Hidden CV HINTS Hofmann A. Home hospitalization Horton R. Hospital Hospital infections Hospital Safety Score Hospitalization at home Hospitals Huddle Iasist ICP ICS ICT ICU IMDMF India Indicators Infographic Innovation Integrated care Integration Internal medicine Inzitari M. Ioannidis J. IOM IPU ITC Jha S. Jordi Varela Kaiser Permanente Kaplan R. Karolinska H. King's Fund Kosowsky J. Krumholz H. Laloux F. Lapuente V. Lean Leapfrog Group Lee T. Less is more Low cost Lown Institute Magnetic hospital Mammography Management models Manzanera R. Markman A. Martí T. Martín L. M. Mass General Mayo Clinic Mayol J. MBE McCartney M. Medical leadership Medicare Medications Meier D. Mental Health Minimally Disruptive Medicine Mintzberg H. MIR Monguet JM. Montori V. MOOM Mortality Moyniham R. Muir Gray JA. Mukherjee S. Multidisciplinary Myocardial code NHS NICE Nuffield Trust Nursing Obamacare OMS Oncology Organizational models Orthopedics Osteoporosis Ottawa AR Outcomes Overdiagnosis Overtreated Overtreatment PACE Paediatrics Palliative care Pané O. Papanicolau Parsimonious medicine Participation Patient safety Patients Patientslikeme Payment system PBM PCC PDH Peris A. Persuasion Pharmacies PHB Pho K. Picas J.M. Porter M. Possible Prasad V. Prevention Primary Care PROA Productivity Pronovost P. Prostate PSA Psychiatry Psychology Public health Pulmonary embolism QALY Quality Ramos L. Rawlins M. RCGP Readmissions Reasoning Redding D. Rehabilitation Research Residents Results Reuben D. Reversion Revocation Rey P. Rey P. Behavior Right Care Risk Rosenbaum L. Roure C. RWJF Sackett D. Saini V. Salwitz J. Sant A. SCGS Schlette S. Schwartz B. Screening Self-Care Self-management Seltman K. Share Share Decision Making Shared clinical decision Shortell S. Sleep medicine Smith R. Sober medicine Socio sanitary Spirometry Starfield B. Statins Status quo Stratification Stroke code Subirana M. Surgery Surgical checklist Sutton System analysis Telehealth Telemedicine Tests Therapeutic overacting Third sector Thyroid cancer TIC Tilburt J. Tolchinsky G. Too much medicine Top20 Topol E. Torbay Torrente E. Training Transitional Care Model Transparency Triple Aim Triquell Ll. Ubel P. US News VA Value Variability VBM VHA Vidal-Alaball J. Vivó P. VPM Wagner E. Warfarina Waste Watcher R. Weber M. Weekend Wen L. Wennberg J. Woltmann E.